A Youth Court program has been implemented in our district for students with minor offenses such as inappropriate behavior, inappropriate language, class lateness, and class cutting. The Youth Court is a part of the Current Issues taught by Mr. Patrick Travers. PWHS Youth Court comprises one student judge, one youth advocate, and the student being written up for the offense. Additionally there are five student jurors and one student jury foreman to facilitate the communication among jurors. All students will take turns with different roles during the Youth court school year. Strengthen school culture and community through positive peer pressure and student leadership. Voter Registration Event Held at Penn Wood H.S. The Penn Wood High School Ninth Grade Student Council and National Honor Society members recently hosted a Voter Registration Assembly at the Green Avenue Campus. Under the direction of Student Council Advisors, high school staff, School Board President Jennifer Hoff and local Lansdowne Votes Representative Carol Carpenter. They talked about the importance of voting – a way to express what is important to you and have a say in who represents you in government, where important decisions are made that impact every aspect of our lives. Students distributed voter registration applications and, when necessary, assisted students in completing the online registration. Ardmore Avenue Elementary School got off to a tremendous start with a Grandparents Day celebration featuring more than 130 grandparents! The school also took part in a Get Out the Vote project led by parent Betsy Burke, Lansdowne Mayor Tony Campuzano, and School Nurse Elizabeth Dunford. Want to help at Ardmore? Save your BoxTops for Education and Coke bottle caps for the School. When you have a good amount saved, just drop them off at the Ardmore Avenue School. Lastly, Ardmore Avenue is always looking for volunteers to help our students. If you are interested in volunteering at Ardmore Avenue Elementary, please contact Principal Joseph Denelsbeck at jdenelsbeck@wpsd.k12.pa.us. 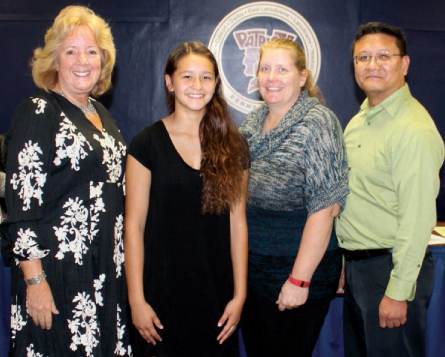 Left to right: Superintendent Jane Harbert, Katelyn Marie Tong, and Katelyn’s parents Kimberly and Jan Tong celebrate Katelyn’s appointment as the 9th Grade Student School Board Representative. Lansdowne resident Katelyn Marie Tong was appointed as the WPSD 9th Grade Student School Board representative. She joins the 10th grade representative Nasharie Stewart and 11th grade representative Lowoe Samolu on the board. Kate is a member of the Marching and Concert Band, Softball and Soccer teams. Katelyn will serve for three years as a voice for her and her fellow students at the board level. Congratulations to Katelyn and parents Kimberly and Jan Tong! A team of parents, faculty, and administrators gathered to provide input for the William Penn School District’s Curriculum Renewal. The effort focuses on Reading and Language Arts. Special thanks to all involved in the process, which includes creating a vision for our literacy program and reviewing available curriculum.